Mix and Match to Create Your Ideal Seating Group! This charming slipcover sofa with chaise features a skirted base and rolled arms that foster a casual seating environment for your living room. A three-seat sofa is modified by adding an ottoman with chaise cushion to create this comfortable and functional sofa with chaise. Plush seat and back cushions are complemented by accent pillows for added style. A skirt wraps the sofa's base, completing its slightly traditional design. The Nantucket Slipcover Sofa with Chaise by Rowe at Saugerties Furniture Mart in the Poughkeepsie, Kingston, and Albany, New York area. Product availability may vary. Contact us for the most current availability on this product. A915-000 Slipcover Sofa Chaise 1 23" 63" 21"
A910-000 Sofa 1 84" 40" 39"
Pillow 2- 21" throw pillows. Leg or Skirt Skirt Covered Base. Padding & Ergonomics Standard M850 cushion consists of an innermost layer of foam surrounded by two layers of softer foam for a plush sit. Feather Soft and Extra Firm cushions also available through upgrade. Bring the look of simple elegance into your living room or den with this beautiful upholstery collection. Featuring softly rolled arms, amply stuffed cushions and accent pillows. 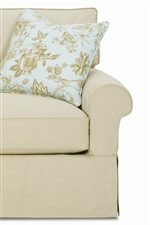 Whether watching television or reading a book, this collection is there to support you in comforting softness. Choose from a variety of fabric colors and textures to customize the collection to match your decor. Durable design ensures that this collection will last for years to come, for you and your family to enjoy. The Nantucket collection is a great option if you are looking for Transitional furniture in the Poughkeepsie, Kingston, and Albany, New York area. Softly Rolled Arms, Plush Cushions and Accent Pillows Give this Collection a Simple Elegance. Browse other items in the Nantucket collection from Saugerties Furniture Mart in the Poughkeepsie, Kingston, and Albany, New York area.